Ghana struck a blow for Africa with a 2-1 win in extra time over the United States at the FIFA World Cup on Saturday in Rustenburg, South Africa. Asamoah Gyan scored in the 93rd minute of the Round of 16 match, helping the Black Stars move on to the quarter-finals in only their second World Cup appearance. 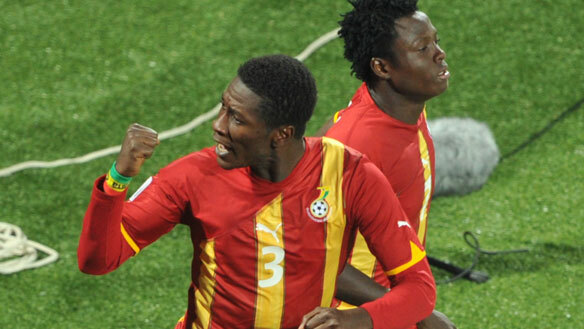 Ghana bowed out in the second round in its tournament debut four years ago in Germany. A Ghanaian striker was crowned King of Africa, his coronation taking place at Rustenburg's Royal Bafokeng Stadium with the entire continent watching. Gyan's goal decided the tension-filled encounter with the Americans, as Ghana kept Africa's faint World Cup hopes alive - Algeria, Cameroon, Ivory Coast, Nigeria and South Africa have already been eliminated. This is not only a historic result for Ghana but also for Africa. Ghana joins Cameroon (in 1990) and Senegal (in 2002) as the only African nations to advance to the quarter-finals of the World Cup in the tournament's 80-year history. A loss on Saturday would have been a devastating and embarrassing blow to African soccer, leaving the continent without a single representative as the tournament enters the final stages. Instead, African pride was restored, with citizens the full length of the continent, not just those living in the host nation, celebrating Ghana's victory as though the Black Stars were their team. As for the Americans, there is only heartache. So much was expected of coach Bob Bradley's team after it qualified for the second round on the back of a dramatic victory over Algeria a few days ago. After defeating the Desert Foxes, the Americans were touted as tournament sleepers. Many critics believed the U.S. had the potential to fights its way into the semifinals. But Landon Donovan, the goal-scoring hero against the Algerians, couldn't conjure any last-minute magic this time around, leaving the Americans to recite that familiar refrain: Maybe next time. Ghana moves on to the quarter-finals to meet Uruguay. The U.S. has been eliminated, leaving Mexico as the only CONCACAF nation still alive in the competition. Ghana's winner was a perfect example of "route one football." Andre Ayew played a long ball over the top of the American back-line, and Gyan did well to fight off his marker before smashing the ball past goalkeeper Tim Howard and into the back of the net. Ghana took the lead thanks to a fantastic individual effort from Kevin-Prince Boateng, who scored the first goal. The Black Stars then repelled wave after wave of attacking play by the U.S. before Jonathan Mensah fouled American Clint Dempsey inside the penalty area in the 61st minute. Donovan converted from the penalty spot and it was an entirely new ball game. With his third goal of the tournament, Gyan became a national hero.